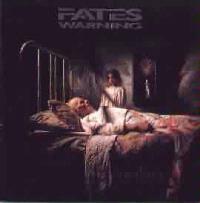 Fates Warning is Roy Alder, Jim Matheos, Frank Aresti, Joe Dibiase and Mark Zander. Dream Theater`s James Labrie provides background vocals on Life in Still Water. The central influence on this album is the older Queensryche sort of sound, although other elements can certainly be heard. If you like older Queensryche (circa Rage For Order and Operation Mindcrime) this album is definitely for you. This is a moody album, based on thoughtful and emotional themes. The first verse of this track seems to call to mind the moodier sounds of Marillion while the latter sections of the piece are in a more solidly prog-metal sort of mood, in the vein of Queensryche. Lyrically, this is a statement of the fact that sometimes, sections of your life have ended, and it is time to "close your eyes and forget the fear, leave the past behind." Based in a more solidly metallic mode, this track still contains some interesting arrangements and is a quite powerful and evocative number. This piece seems to address similar ideas to those presented in Leave the Past Behind. "Feeling the weight of unseen chains, this routine is growing thin, it`s a narrow path that we walk, and the walls are closing in." This is another considerably passionate piece. This number is a pleasantly accessible cut with both genuine metal and progressive leanings. The hook here is quite catchy, and the verse is a touching work with a vaguely sad feel to it. It is really hard to put a finger on the influences here, although Queensryche certainly figures into the equation. "We can move each other to tears, but we can`t see eye to eye." A wonderfully moody intro complete with backwards guitar leads into the central theme of the song. This track is a moving piece and is quite sorrowful. It seems to lament a theme which shows up frequently on this album, the end of relationships. "somewhere along the way, we exchanged our dreams for selfish pride, there was a common goal, but somehow that vision has died." The ending segment takes on Queensryche styled themes, in a more solidly metallic format, which alternates with a different treatment of movements that began in the early segments of the song. The number again drops way down into the moody and poignant vein which began it, bringing this piece to a satisfying conclusion. Point of View addresses the issue that, even though we disagree, our views are really not all that different. "caught up in our convictions we forget, how our senses distort things we see, we can`t accept our differences, but we can always disagree"..."where I stand is not so far from YOU, a different opinion is just another point of view." This piece is one more solidly metallic treatment and is quite well done. Another track about endings of relationships, "today was the end of a dream, as I watched your shadow disappear", We Only Say Goodbye is a wonderfully innovative track, building on familiar themes, but injected with a lot of originality. This is another nicely moody and melancholy song, and features both melodically haunting and emotionally charged balladic sections and a wonderfully crunchy and energetic chorus hook. Don`t follow me is another strongly metallic and well thought out piece of music. Set in that particularly moody texture that this band does so well, this track serves as a very good conclusion to the album.